Finished unpacking the boys from camp. You are not going to believe me when I tell you this. But it’s true. No one could make this up. When I opened the plastic soap box in which I’d lovingly placed the brand new bar of Zest for one of my darling sons, I noticed something. The soap was in tact. The letters engraved – Z. E. S. T. were perfect. Water had never touched it’s deodorant-cleaning-nice-smelling surface. < It’s a small world. But I wouldn’t want to paint it. carved into a small animal! gotta give points for creativity. LOL insanely @ amyz5!!! I have two boys, thankfully now grown and each fully aware of where their soap and towel is. 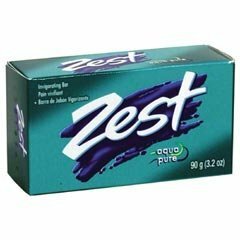 But that bar of Zest brings a lot of unwelcome memories back! Been there, (he’s) done that. (Ughh!) This year I tried liquid soap in a shampoo-type bottle. However, your post reminds me that I have no idea how much was used because I had him do most of the unpacking. Hmmm… Will be checking later…. The exact same thing happened in our house. So I asked, stupidly, “What did you guys use to clean your bodies when you were at camp? Seeing how your soaps are STILL IN THE BOX! !” Their simple answer,”Shampoo, sometimes”. I don’t what to know what they used the other times! However, the deodorant was definitely used. HA HA HA – thanks for sharing life-with-boys with those of us without any children!